This is the audiobook I started so long ago for the 48 Hour Reading Challenge, a teen dystopia with diversity. Legend. 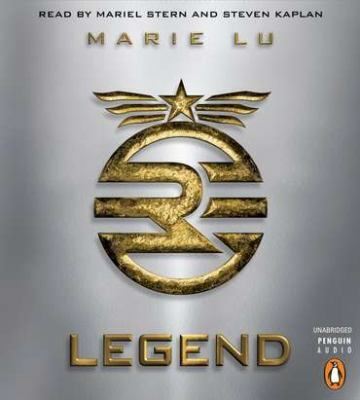 Book 1. by Marie Lu. Read by Steven Kaplan and Mariel Stern. Penguin Audio, 2011. Legend is the first book in a dystopian trilogy for teens. It’s a deliberate retelling of Les Miserables, with the two main characters roughly modeled on Javert and Jean Valjean. I was obsessed with Les Mis myself in high school, keeping the cassette running in a loop in my room, which piqued my interest in Legend. In whatever future year it is, the United States has been divided. The west is now the Republic, which has been at war with the eastern Colonies for as long as anyone can remember. In the Republic, children train to undergo the Trials at age 10. The test covers academic, physical, and psychological aspects, and determines whether children will be receiving moderate or high levels of education – or just sent off to labor camp. It’s a theoretical meritocracy, though in reality, people born into the labor classes don’t get sent on the Academy. The Academy itself trains the best and brightest to become soldiers. June, our Javert character, is the only person on record to achieve a perfect score in her Testing, and at just 15, is the youngest ever to graduate from the Academy. She’s aiming to join her brother Matteas, a young officer on his way up. Though her parents died in a car accident years ago, they’ve never wanted for money and live in a luxurious apartment building with meat to eat on a regular basis. Her counterpart Day was born in the slums and failed his trial, but ran away afterwards. Only his older brother still knows he’s alive – he’s kept his existence a secret from his mother and younger brother. Now he’s the most wanted criminal in Republic City, stealing from the government both to thwart its goals and to give to the poor. June and Day cross paths indirectly when Day learns that his younger brother has come down with the Plague that runs through the poor districts on a regular basis. He breaks into the hospital without his usual careful planning to steal medicine. The sloppiness winds up with Day badly wounded, without a cure, and with Matteas, on guard duty at the hospital, lying dead with Day’s knife in his heart. June is assigned to track down her brother’s killer and find out if he really is the notorious Day. Backing her up behind the scenes is Matteas’s protégé Thomas, who’s clearly also interested in a romantic relationship with June. I picked this up looking in some desperation for a speculative fiction title on audio with diverse characters that I hadn’t already read. I’m sure there are more out there, but this was one that one of our pages with similar reading tastes recommended. While the characters are diverse, it’s not made into a thing at all. Day is described as blond and blue-eyed, with somewhat prominent eye folds. June finds out halfway through the book, as she’s digging into his background, that his genetic background is primarily Mongolian. June has a dark ponytail and dark eyes, and it was only in an interview with Lu that I found online that I learned that she’s mostly Native American – though at this point in history, all ethnicities are very much mixed. This has all the required elements of a teen dystopia, including the ruthless government, the learning of dark secrets about said government and the Shattering of Illusions, the love triangle (not so annoying here as sometimes due to June’s lack of brooding over it), forbidden love, and young people pushed into violence. It also includes Sherlockian observation skills used by both main characters, parkour, illegal street fights, and nonstop action. It was more violent than I prefer, with lots of innocent people killed right in front of us, family members as well as strangers, but I still found myself sucked in and thinking about it constantly. It’s told from both June and Day’s points of view, with two narrators on the audiobook. This works really well with stories told this way – I’ve very much enjoyed Maggie Stiefvater’s books on audiobook done this. Here, Mariel Stern does an especially fine job with June, who starts out a not very likable, overly self-confident character – very noticeable in her voice as well as the text. Day doesn’t need to undergo the same kind of transformation, but Kaplan does well at making him sound like his character – confident and good-looking, but still only 15. I don’t know that this is one to convert people who don’t like dystopians, but for those who already are or who would like to try the genre, this is a compelling start to the series. It continues with Prodigy (2012) and Champion (2013). This entry was posted in Books and tagged 48 hour book challenge, audiobooks, diversity, dystopia, multiculturalism, teen fiction. Bookmark the permalink.